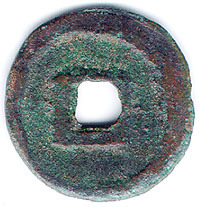 Like most other East and Southeast Asian countries, Korea used Chinese currency from ancient times. Korean dynasties began minting their own coins at the time of the Koryo dynasty (918-1392). The earliest of three issues was minted from the late 9th century and called **t'ongbo (ch. 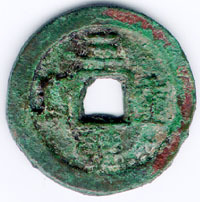 Tung Kuo T'ong Bao), but Koryo coins are scarce, suggesting that to the degree that cash was used, Chinese coins were prominent. This was similar to the case in Japan. The suceeding Choson (sometimes called Yi but Koreans generally prefer Choson) dynasty (1392-1910) minted coins in great quantities. Unlike the Chinese dynasties which changed the coin legends with each reign name, the Choson dynasty used only two basic legends. 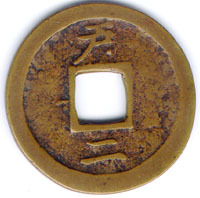 the first was the coin pictured above, the Choson t'ongbo. This was minted from the year 1415. The legend changed in 1633 with the introduction of the Sangp'yong t'ongbo. This coin was minted until 1883. It exists in near infinite varieties with diverse mintmarks and denominations. I have yet to find a good site introducing Korean cash coins. Some books exist but I do not have them available to me so this page may contain a number of errors. If you notice any please contact me at the address in the green field above. The Koryo dynasty lasted from 918-1392. It began by controlling the northern and central portion of the peninsula south of the kingdom of Parhae (Ch. Pohai). To the south were smaller kingdoms of Paekche and Silla but they were defeated and incorporated into Koryo around 935. Parhae fell around this time to the Liao (Khitan) dynasty and Koryo expanded north to cover most of present day Korea. I have read differing accounts of the minting done by the Koryo dynasty. One account, A New History of Korea by Ki-baik Lee (Harvard U. Press, 1984; p 122) says that the first coins were minted in 996, and the Haedong t'ongbo was minted in 1102. The Japanese Nihon Ginkou Chousakyoku ed., Zuroku Nihon no kahei, vol.1 (Tokyo: Touyou Keizai Shinpousha, 1972), p 104 which describes coins imported for use in Japan in the medieval period has all Koryo coins as issued in 1097. 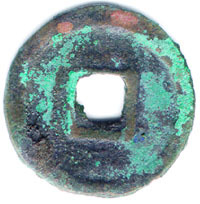 This coin is a variant version of the earliest Coin of the Koryo dynasty the **t'ongbo (Ch. Tung Kuo T'ong Bao). This variant used the character for heavy or piled instead of circulating so it is called a (Ch. Tung Kuo Zhong Bao), read top bottom right left and meaning "heavy treasure of the eastern country" refering to Korea. These early coins are copper alloy but all have a distinctive rough, almost ironlike, feel to them and are thick. I have not cleaned them because I do not want to harm the coins. This and the two below were found in Java--possibly imported there during the flourishing of the Majapahit dynasty (1293-1520). 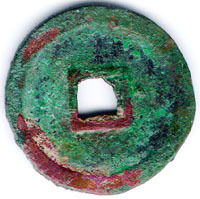 This coin is the seal script version of the Haedong t'ongbo which means "circulating treasure of (the land) east of the sea" a reference to Korea in relation to China. This coin is pretty clean but rather beat up on the left face. 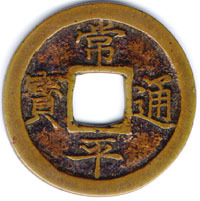 This coin is the formal script version of the *han t'ongbo (Ch. 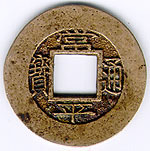 San Kan Zhong Bao), also issued in the Koryo dynasty. The Koryo had unified three separate states on the peninsula in the 10th century by conquering Silla and Paekche on the southern end. 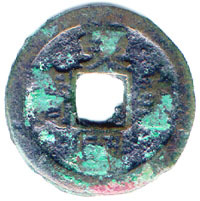 The name of this coin means "heavy treasure of the three han (peoples)" in reference to this history. I have not yet tried to clean this coin for fear of damaging it. This Choson t'ongbo is one of my favorite coins. I like the character shape, the colors and even the dent on the rim. 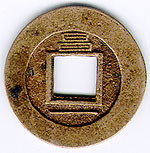 Choson t'ongbo were minted by the Choson dynasty from 1423 up until it changed the legend to Sangp'yong t'ongbo in 1633. Choson was the name of the kingdom under the Choson dynasty, and this coin was its basic currency for over two centuries. 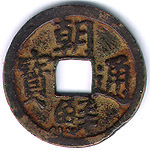 This Sangp'yong tongbo is a value one coin from the late Choson dynasty. The name means "always peaceful circulating treasure." I think the tip character on the back denotes the mint and the bottom character the value, but I need to confirm this. This coin is particularly nicely made and just may be a mother coin. I will have to research this. 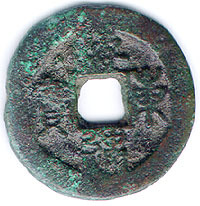 This Sangp'yong t'ongbo is a large, coin probably from the late Choson dynasty. I think the top character on the back denotes the mint, and the bottom (the number two) the value, but I need to confirm this. The calligraphy of the front is very elegant and the make of the coin itself is of the highest quality.